When I arrived in Oceanside, I obviously decided to first research anything I could on Francisco de Ulloa being in Oceanside. I researched records, maps, and old newspapers. I found an enormous amount on the subject. Both the San Diego Historical Center and the Oceanside Historical Society offered clues to the mystery I was out there to solve. First I will tell you that everyone that was a historian or academic denied the fact that Ulloa landed in Oceanside, but as a treasure hunter I suspected that this was not necessarily so. All the information written to support the theory that Ulloa in fact did discover California before Cabrillo was put forth by a Dr. Joesph Markey. 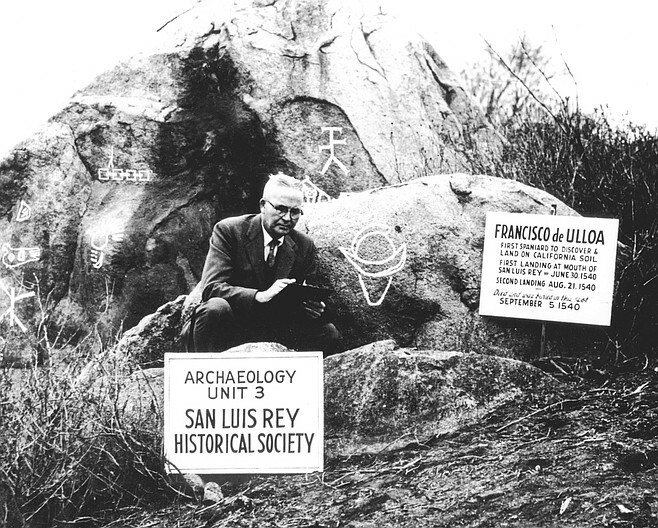 Joseph Markey was not just anybody, but was a man involved all over the world discovering archaeological sights. He was well off and entertained Hollywood celebrities at his home in Oceanside. I might mention that he was also a practicing Doctor. Markey professed that Ulloa was in fact first and that Ulloa’s ship, the Trinidad, sunk off the coast of Oceanside, and there was a reasonable suspicion that there was treasure from this ship hidden somewhere in the San Luis River Valley. According to Markey he not only found some Spanish artifacts from this voyage, but also found Ulloas grave as well as the mass grave of his shipmates in a cave. In fact, in 1952 Markey gave a speech attesting to all of this. He included pictures of Ulloas grave (which I supposedly saw on a T.V.show years back). He also had pictures of the remains of 22 skeletons of Ulloa’s crew. At first, Dr. Markey’s claims were somewhat received by academia, but later on widely criticized. The so called academia experts called Markey’s claims a fraud. So what was the truth behind Markey? Were his claims that it was Ulloa and NOT Cabrillo who discovered California true? I was about to learn… and this sent me on a much bigger adventure than I had bargained for! Stay tuned for more coming in this thrilling mystery and chase.